Tucked away on an Adams Morgan side street, off the alley entrance and past the Harley, lies a secret patio that just happens to be the headquarters of a foodie subculture – Grillworks, Inc.
I’ve known Ben for over a decade, and in the majority of those years the highly coveted grill party invites have seen quite the menu range. From regular ol’ burgers to caribou sausage, from butterflied salmon on a bed of dill to goat leg – and those are just the protein options! The simple beauty of the grill’s design enables it to weather all seasons, and it’s slowly expanded from just a quiet secret amongst locals to celebrity chefs and newscasters. And honestly – there’s just nothing like the hypnotic dance of the wood burning flames as they light the night. Ben could easily pick up and move to another city. A Michigan native, he came to DC in 1993; his grandparents have lived here for a long time, and it seemed a manageable starter city for someone who’d never lived in a metropolis before. But somehow, as with so many of us, the city sucked him in. Ben’s a Washingtonian now. I asked him to talk about why he loves DC, the challenges of being a local entrepreneur, and where he goes to get his grub. Why do you love living in DC? A lot of the things people mention as shortcomings about the city are really assets! If you want high rise, get on the train. You don’t need to live with all that. I love that I can get on the motorcycle and within ten minutes I’m in the rolling countryside. I can get a taste of the country and then get back to urban in one afternoon. Of course there’s also history – I’m the guy who stops for all the historical markers and reads every one. All that and we’re only three hours from open ocean – for a fisherman that’s a big deal. It can’t just be the easy access, come on. No, it’s striking that this is such a green city. Walk outside on a sunny day and you can actually feel the sunlight, you’re not walking between skyscraper canyons in perpetual shade. Like so many people, I first saw DC in cherry blossom season – you can’t beat DC in the spring. And my colorful ‘hood, Adams Morgan, is a living mural. Over the years the city’s seen a lot of changes. You’ve lived in Adams Morgan for most of it. Yeah, back when I bought my house I occasionally found my way home via blood trail. I even got mugged once a few hundred yards from my house. That was annoying. Funny that when I moved in I was part of the gentrification, now if I don’t cut down my weeds I’m dragging the whole block down. The original pioneers are now the scruffy ones surrounded by new. But I love it – as soon as I moved to DC I was spending most weekends in Adams Morgan, so living here was a natural choice. If you hate on Adams Morgan, I suspect you’re picturing a Saturday night. Come here midweek – the best nights to experience how eclectic, colorful, and alive it is. Favorite spots in Adams Morgan? When I tell people I’m at the OTHER office, they know I’m at Tryst. Remember when it was an auto parts store? It’s the dazzling anchor of my Adams Morgans ‘hood, and a real DC business success story. The friendliest bar in DC is Madam’s Organ. On Wednesdays they do live bluegrass and you’ll often find me there. A silly time you would never expect in (proper) Washington – happy people, no attitude. Outside of Adams Morgan, I think Marvin really lives up to the hype. Excellent food and perfect mix of DC dwellers, from clubkids to village elders, K Street to hipsters. The people-watching is a great blend of different groups. Biggest challenge as a DC entrepreneur? 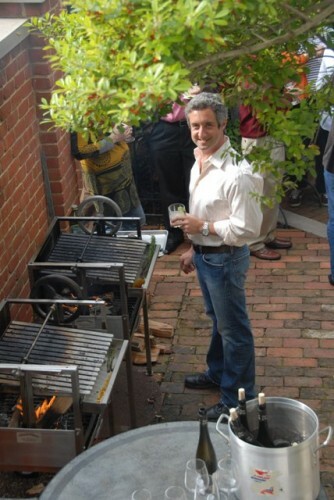 DC restaurants, foodies and chefs are passionate about my product, but since all of my grills are handmade for a special grillery niche, they aren’t for everyone. When I talk to customers on my (202) line, they’re clearly surprised DC is the place they’ve called to get the “purest grill in the land.” My biggest grill markets are New York, Los Angeles, San Francisco, and the cities of Texas. But though I love visiting I don’t need to live in any of those places. I live here. So again, access is what DC gives me. Ok, who really owns a Grillery? Is it just famous people? How about the DC folks? Christiane Amanpour, Tom Brokaw, Faye Dunaway. Damien Hirst owns six (“hottest accessory to hit London” – great, but no one here seems to know who he is!). Dan Barber of Blue Hill. But it’s not just celebs, DC foodies love it, with the mild weather and all our outdoor patios. 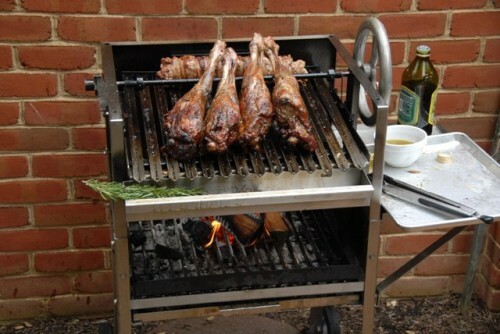 We did a grilled goat party in Georgetown with Chef Thang from Hank’s and previously Komi. The owners of Restaurant Nora have owned a Grillery for at least a decade. Craziest thing you’ve ever grilled? Bear. At least it was local! The guys who build some of our custom grills in Charlottesville, one of them is a big hunter, and just offered one day – “hey, you want some bear? Who was I to say no? I put it in buttermilk overnight and then did a second marinade in wine. Buttermilk pulls the heaviness out and wine tenderizes. If I did bear again, would probably only do the wine, as buttermilk robbed it of too much character. What did it taste like? Beef. I admit to being a little fearful of my main course that evening. Bone-on rib steak. Get it an inch and half thick at least so it can stand on the bone. Sea salt, minced garlic, baste with butter or olive oil, cook standing on the bone for all but the last ten minutes. The flavor around the bone is always the best, so cooking the meat using the heat of the bone spreads that flavor. A fine rib steak cannot be beat in my book. 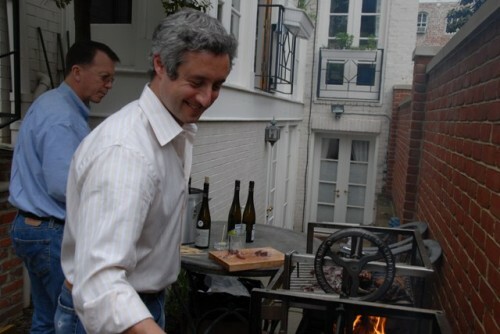 If you aren’t grilling yourself, what are your top DC spots for food? Love sushi. Took my mom to dinner at SEI and didn’t even touch the soy. Both of us felt it was the best sushi ever. I’m usually suspicious of steak places because I’m a bit of a snob, obviously! But if steak tartare is on the menu anywhere, I have to order it. Love it at Bistrot du Coin’s bar. In my ‘hood, New Orleans Café for the best breakfast – their eggs benedict with fried oysters really takes you to NOLA. The goat party pictured was set at the spectacular Georgetown of Jan W. – thanks Jan! I miss grilling. Hopefully soon I’ll return for a ‘fix’.